When I first saw this polish on Dorra's blog, I wished I had one too. I also enjoyed reading the story behind this polish. I needed to get my hands on it, somehow, some way. 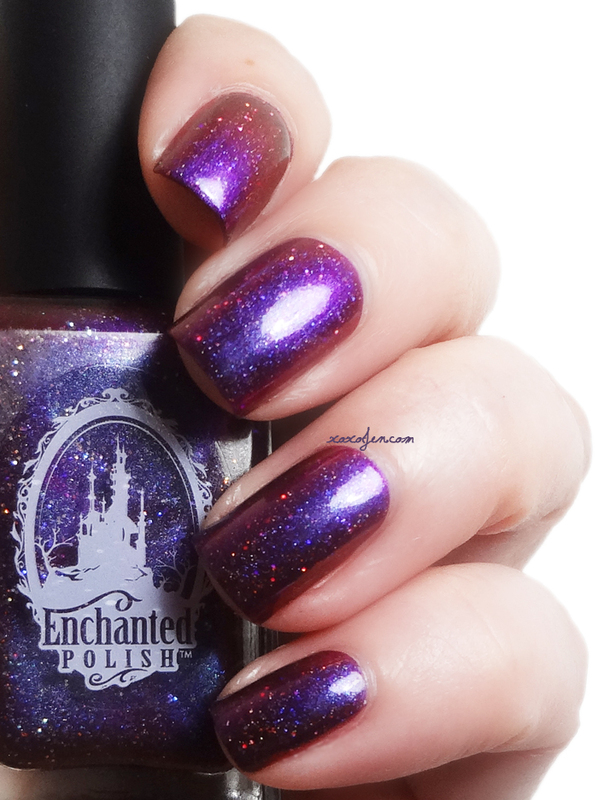 Luckily it was stocked on the Enchanted Polish webpage and available for me to purchase! I wore it almost right away when it arrived. It is as beautiful as it looked in the photos I saw and I was thrilled to finally get to wear it. I found the formula a little thick, but workable. I also noticed an unusual scent that I had not noticed with other Enchanted polishes. It isn't foul, just different. I chose to publish a purple polish on my blog today because I saw an opportunity to help raise awareness of domestic violence and how very real and scarey it is. October is domestic violence awareness month which was conceived by the National Coalition Against Domestic Violence. The intent was to connect advocates across the nation who were working to end violence against women and their children. http://dvis.org was founded in my home town in 1976, when an abuse victim helped organize a task force to provide telephone crisis counseling for victims of abuse. The organization has grown exponentially over the years and is available in many cities today. If you know someone trying to get out of an abusive relationship, please encourage them to seek help with an exit plan rather than do it on their own. In October, I wear purple.